Good luck trying to find someone who will speak ill of Lawrence Jones. 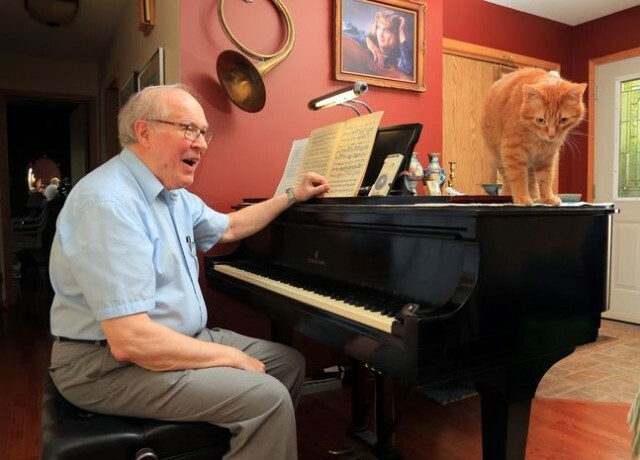 The renowned local pianist and “retired” Brandon University music professor has earned a sterling reputation among colleagues and students during his 54-year career. For Jones, the accolades are nice to hear, but teaching has always been about sharing his passion for music with others — a passion that grew from humble beginnings. Jones was born on a small farm south of Ninga during the Great Depression, but realized early on that farming wasn’t his forte. “I was the kind of kid that pestered the neighbours who had pianos,” Jones said. Jones was drawn to the instrument the first time he sat down in front of a set of keys. Something just felt right. Jones’ parents decided to buy a piano when the family purse strings loosened slightly in the 1940s. Jones and his three sisters learned the basic chords and scales from their mother and cousin, both of whom had formal piano educations. The radio, which also entered the home around the same time as the piano, became a major source of inspiration. Jones would try to play the songs he heard from memory. “One of the first tunes I remember liking was the ‘March of the Wooden Soldiers,’” said Jones, who paused to hum the bouncy melody, his right hand conducting the tune in the air. Every Sunday, Jones would listen to the opera broadcasts on the local radio station. These early encounters with classical music formed a lasting love of the complex genre. “It runs the gamut of human emotions and doesn’t restrict itself to being entertaining,” Jones said. When Jones was in his early teens, he started playing piano for local theatre productions and competing in festivals. At a festival in Hartney, Jones played the Pathetique sonata from Beethoven’s 13th opus for an adjudicator by the name of Lorne Watson, who would later become an influential director at BU’s School of Music. “He heard me and he hated my playing,” said Jones, laughing. After receiving a pointed letter from Jones’ father, Watson agreed to let the young man study under him for a year. This piano scholarship was an eye-opening experience for Jones. When the year was over, the family moved to Winnipeg, and Jones started studying under Filmer Hubble, an organist and choir conductor — and someone who would greatly impact Jones’ style of teaching in the future. After graduating high school, Jones got his bachelor degree from the University of Manitoba’s music program and his masters from the Yale School of Music. During this time, BU’s music program was expanding and Watson needed teachers. In 1961, Jones moved back to Westman and started teaching his first crop of university students when he was just 25 years old. “One year led to another, and eventually I was taken on the faculty in a full-time way,” said Jones, who taught piano, music history and music theory during his tenure. With no formal teacher training, Jones took inspiration from his past instructors and tried to create a diplomatic classroom experience for his students. The professor continued his own academic pursuits by studying for a year at Juilliard in New York and later completing his doctorate at the University of Iowa in 1985. When he returned to BU, Jones became the dean of the school of music. This five-year term was rewarding in many ways, but for Jones, the highlight was completing the construction of BU’s Queen Elizabeth II Music Building, which he says helped bring brought national recognition to the music program. Jones officially retired from BU in 2011, but at the age of 79, he continues to teach part-time and will be taking on four new students this fall. After all these years, he continues to find joy in being an educator. When Jones announced his retirement, Greg Gatien, a BU professor and the acting dean of the music school, asked if he could sit in on one of the professor’s lessons before he left. Gatien was struck by Jones’ ability to not only explain complex musical theories to young people, but to also instil a genuine love of music in his students. Since Jones has retired without actually retiring, there hasn’t been an fitting tribute to the longtime educator, according to David Wilson, executive director of the Augustfest Homecoming Concert Series. To right this oversight, Wilson decided to host a luncheon honouring Jones on the opening day of this year’s festival. This Wednesday, friends, family, students and colleagues will gather at St. Andrew’s Presbyterian Church at 12:30 p.m. to pay tribute to Jones’ contribution to music in Canada. “It never seemed to me that there had been one major event saying, ‘Hey, thanks for all you’ve done,’ so I wanted to do that,” Wilson said. Wilson is thankful for Jones’ support of Augustfest during its six-year run. “He doesn’t have the title of artistic director, but I defer to (Lawrence) many, many times for his advice on who to ask to perform,” Wilson said. During the luncheon, Jones will perform for an audience for the first time in years alongside his daughter Laura, a concert cellist who is currently living in Toronto. Laura isn’t surprised that the community wants to celebrate her father’s lifetime of achievements. “I think it’s a fantastic thing and it’s definitely well-earned,” she said. Music was a fixture in Laura’s life growing up — when she was a baby, her parents would put her in a bassinet under the piano while they practised songs by Brahms and other famous composers. Jones saved the day for Laura when her accompanist dropped out of the final round of a competition in Toronto and she called home crying. Jones says watching his daughter follow in his footsteps makes him proud, but leaves him with mixed feelings. “On the one hand, it’s just great to have somebody enthused about an art that you love yourself. On the other hand, it’s a difficult profession. Making a living in it is a big challenge,” Jones said. The pair are looking forward to reuniting on stage for their short set at the Augustfest luncheon. Tickets to the event are $20 each and available from the BU School of Music until Monday.